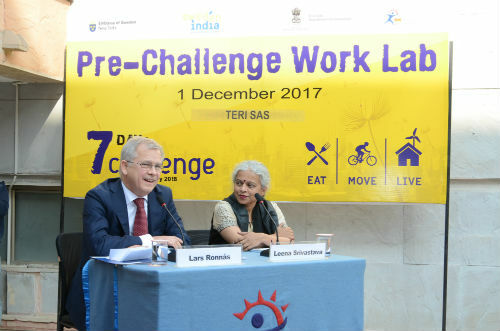 New Delhi: TERI School of Advanced Studies, in its endeavor to promote education and action on sustainable development, launched India’s first ever ‘7 Days Challenge’. The initiative is a youth oriented drive to encourage awareness about lifestyle choices and their effect on the sustainability path. Interested individuals will be encouraged to take more sustainable and smart actions around choices they make as they EAT, MOVE and LIVE their daily life. The programme is in association with Embassy of Sweden, within the Sweden India Nobel Memorial Program 2017 and Eco-Club initiative of Department of Environment, Government of NCT of Delhi. The ‘7 Days Challenge’ aims to encourage both innovation and awareness about lifestyle choices that contribute to sustainability, not only for 7 days but beyond for a lifetime. The Pre-Challenge Work Lab was held at TERI School of Advanced Studies as a starting point for the 7 Days Challenge. The event officially announced the 7 Days Challenge for school/college students across Delhi NCR and was graced by H.E. Ambassador Lars Ronnås, Swedish Ambassador for Climate Change, who along with Dr Leena Srivastava, Vice Chancellor, TERI School of Advanced Studies and representatives from the Eco-Club initiative of Department of Environment, Government of NCT of Delhi interacted with over 230 students and teachers and PhD students of TERI School of Advanced Studies. The Work Lab involved informative and interactive sessions, group activities and briefing on how to report their daily routine and updates as they take up the challenge. The teachers along with the participants of the work lab will act as facilitators for other participants at their school/college level during the 7 Days Challenge, becoming mentors and ambassadors of change towards sustainable living. During the Challenge, participants will constantly update their daily activities on the ‘My Report’ page on the Challenge website, www.sevendayschallenge.com, which can be submitted every day and after the completion of 7 days. Participants are encouraged to bring about some innovative actions during these 7 days. The Challenge will culminate with the felicitation of winners of the Most Innovative Actions Awards at a grand reception at the Embassy of Sweden in Feb 2018. The winners and selected participants will also present their experiences of participating in the 7 Days Challenge.